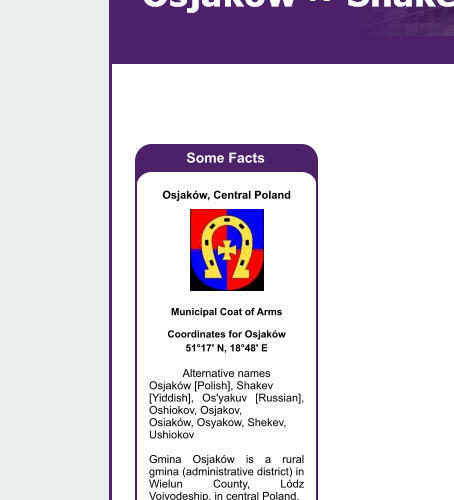 Osjaków, Central Poland Municipal Coat of Arms Coordinates for Osjaków 51°17' N, 18°48' E Alternative names Osjaków [Polish], Shakev [Yiddish], Os'yakuv [Russian], Oshiokov, Osjakov, Osiaków, Osyakow, Shekev, Ushiokov Gmina Osjaków is a rural gmina (administrative district) in Wielun County, Lódz Voivodeship, in central Poland. The municipality administrative centre is the village of Osjaków, which lies approximately 17 kilometres (11 mi) north-east of Wielun and 73 km (45 mi) south-west of the regional capital Lódz. The gmina covers an area of 100.74 square kilometres (38.9 sq mi), and as of 2006 its total population is 4,780. These pages are a basic introduction to the rural village of Osjaków and to aspects of its former Jewish life and history. Today it is an administrative centre for the villages and hamlets of the area and is one of a cluster of towns, villages and hamlets at the southern reaches of the River Warta which, before the Second World War, had long established mixed Jewish and Christian communities. Close to the ancient border between Lower Silesia and the Kingdom of Poland, Osjaków’s early history was bound up with the extraction of iron ore, farming crafts and trading between the two areas. The local Jewish community’s involvement in both the trade and agriculture of the area helped shape the village. The village itself first appears in records around the period of 1260. It gained a formal town charter in the 1400’s and was know for iron ore extraction and iron production as well as agricultural produce and its associated monthly chartered market. The village lost its town charter in the late 1700’s after a fire virtually burned down the whole of the village but it continued to hold its market, which was held on the first Monday of the month, for local merchants as well as those from Wieluń, Działoszyn, Szczerców, Widawa and Belchatów.